Prenatal detection of vesicoureteral reflux (VUR). A, Ultrasonography showing mild fetal hydronephrosis. B, Postnatal voiding cystourethrogram (VCUG) showing grade 4 VUR. C, Graph showing small renal size in the same infant. Vesicoureteral reflux has been identified in neonates in whom prenatal ultra-sonography examination reveals hydronephrosis [21-28]. Normal infants do not have VUR, even when born prematurely [29,30]. The severity of reflux often is not predictable on the basis of appearance on ultrasonography [22,31]. Hydronephrosis greater than 4 mm and less than 10 mm in the anteroposterior dimension on ultrasound examination after 20 weeks' gestational age has been termed mild fetal hydronephrosis. Mild fetal hydronephrosis is associated with VUR in a significant percentage of infants [26,31]. 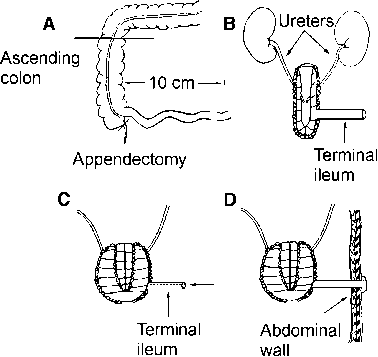 Despite the absence of a previous urinary tract infection, many kidneys affected prenatally exhibit decreased function [22,24,32,33]. Unlike the focal parenchymal scars seen in infection-associated reflux nephropathy, the parenchymal abnormalities seen in prenatal VUR are most commonly manifested by a generalized decrease in renal size (reflux nephropathy grade 3 or 4) [34,35].